Rep. Elizabeth Esty of Connecticut kept a top staffer in her office for months after learning he had threatened and harassed another female staffer. Esty apologised Thursday in response to a Washington Post report detailing the ordeal from 2016. A Democratic congresswoman apologised Thursday after a Washington Post report described how she kept an employee on staff for several months after learning he had threatened and harassed another female staffer. Tony Baker, who served as chief of staff for Rep. Elizabeth Esty of Connecticut from 2014 to 2016, left a threatening voicemail for Anna Kain, a staffer whom Baker had once dated, The Post said. “You better f—–g reply to me or I will f—–g kill you,” Baker said on the voicemail, according to The Post. 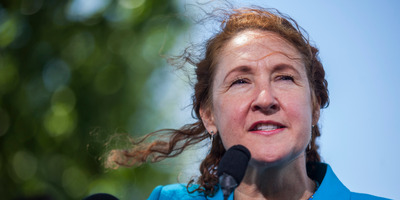 Esty learned of the threat within days but did not immediately fire Baker, even after Kain provided evidence that he had physically and verbally abused her in Esty’s office, according to The Post. Esty kept Baker on staff for nearly three months, providing him a severance pay of $US5,000 and a glowing letter of recommendation for his next job. Esty apologised in a statement after the report became public, acknowledging that she failed to take action. Esty also said she planned to reimburse the US Treasury for the $US5,000 of severance given to Baker.